But, what if you’re “sort of” in favor? Something is very wrong if everyone around the table is in %100 agreement on complex issues. Marc, a commenter on yesterday’s Leadership Freak blog post, explained a voting method that refines the typical “yea or nay” approach. He called it the “Five-to-Fold” method. Five fingers. You’re all-in and prepared to own the project. You’ll take the lead if asked. Four fingers. You give strong support and active participation, but you’re not willing to lead the initiative. Three fingers. You’re on board. Two fingers. You have important reservations but will support the initiative. One finder. You have serious reservations but will not block or subvert the effort. You also commit to open communication regarding your reservations. Folding – no fingers. You want to block the proposal because you believe it’s damaging. Note: Folding is part of the process, not a failure. Every legitimate vote is an opportunity for dissent. Forced consensus drives dissent underground. Honest consensus-finding welcomes – even invites – dissent. Find acceptable levels of unity without browbeating dissenters. Real consensus is never achieved by sacrificing your values or strongly held beliefs. Determine how you’ll respond to low or no support for an idea before taking votes. How will you respond to the one or two finger votes? What about the Fold votes? I’ve never used the Five-to-Fold method. What pros and cons do you see? Suggestions? I’ve used this method as well and find it a good way to spur conversation without team members feeling like they have to ‘speak up’. Once you see those less-than-three fingers, you can ask questions to help get to the issues that might be hiding there. Even questioning the 3s and 4s can help identify valuable tweaks and improvements. Most employees have valuable contributions, it just might take some coaxing and assurance of a safe environment. If it becomes evident that ideas might be ridiculed or casually dismissed, you will definitely lose out on important ideas and employees will become disengaged. Oh, and make sure everyone votes (raises their hands with their chosen number of fingers) at the same time, otherwise some will let themselves be swayed. Thanks Jim. Great to hear from another voice of experience. Viewing decision-making as a process really helps. What to do if a fold or 1 – 2 fingers are the result of a vote? Conflict resolution strategies need to be agreed upon when there is no conflict and before emotions are attached. It all depends on culture in the room. Just think that you are discussing what to do with ISIS. Nice one! I also like to use “dot voting” (called many things) where you get colored sticky dots to place onto easel pad sheets with detailed ideas. You can give out three dots for 5 sheets or similar with the rule that you cannot vote on your own table or team’s work. You can also give out different colored dots for multiple rounds of voting. Most of my facilitation work is with large groups, so we often have a LOT of sheets on the wall and give people 5 dots to vote with, maybe with one vote with green dots as to which has the best profit potential or blue dots for “Best Thing to Do” and yellow dots for politically / culturally most difficult and red for what needs top management approval, or something along those lines. Five to Fold is a great decision making, evaluating and valuable discussion provoking technique for young adults. As a young ‘businessman’ I have found myself at times hesitant to voice the reason(s) behind my stance on a decision…therefore I knew that other young colleagues were most likely feeling the same way. We will continue to use ‘barrier breaking’ (ice breaker is too cliche these days, make us young folk think of high school drama class lol) techniques such as five to fold. Thanks!! I like the idea, the swaying issue sticks out so for anonimity I suggest hidden ballot with 1-5 markings allowing for freedom of choice without the fear. Of judgement. I also like the point of discussion to prove or disapproval beopen before the vote to allow thoroughness to make the best choices. We use this a lot on agile projects, most often to demonstrate confidence in something (such as, will we achieve our goals by the end of this 2-week iteration), although we call it ‘fist to five’. We also use a variation of it as a simple way to estimate the size (complexity) of a problem, as an alternative to ‘planning poker’. In all cases, we have to be vigilant to spot when people hesitate before voting; when this happens in planning sessions, I refer to this as ‘Planning Snap’ instead of Poker (and wrote about this recently http://davidjcmorris.com/index.php/2014/09/planning-snap-how-planning-poker-can-go-wrong/). Making the agenda items public ahead of time is a great way of combating deer-in-the-headlights voting. We’re often in such a rush to get to the solution phase of the conversation, we blow through what should be the longest stage of it – information-gathering. Discovery and inclusion are such important components of the decision making process, I ultimiately support any method which allows for positive results. As a meeting participant, I have received the request to offer a visual showing of support with five to fold, thumbs, hands, clapping, and of course a simple verbal response. I believe that all approaches have merit however, I have never used them. As a regular facilitator of meetings, trainings, lectures, etc, I have attempted to create a collaborative environment based upon the expectation (at times bordering on requirement) of active participation. Here are some of the things I consider when presenting voting topics. Do I have a collaberative team willing to speak their minds? If yes, outstanding. If not, I have challenged myself with better understanding why. The quick answer is, I have not considered the processing style of the various players on my team. As an example, I have offered myself up for many years as a doer, willing to make decisions in the moment. As I’ve grown older, that approach has changed for me. What I have found is that I often hesitate when making a decision or even participating because I feel unprepared to do so. 1) Give the agenda topics to your team in advance. Allow them an opportunity analyze in private and in advance. You will often find a much more prepared and active team. 2) Reach out to all of the players involved in your decision making process to better understand how they process information. Are they visual? Do they need graphs and charts? Do they like to ask questions off line etc? Give them what they need. 3) Prepare for the devils advocate. Their rationale can either derail or truly enhance a conversation. 4) Saying that opinions are valued in a “safe” working envrinoment doesn’t make it so. Do you have the credibility to make that assertion? Safety is attributed to trust, trust is attributed to deeper more intimate connections, and the deeper connections come from grounded relationships. 5) Always exhibit transparency. If you are troubled with a proposal or decision, be willing to publicly show up for what you believe. 6) Don’t settle for an approach if it isn’t working. You can tell when something doesn’t work with your teams. Sometimes I have actually heard eyes roll while presenting a new idea or program similar to what we are discussing. Thanks for opening up the conversation. Evan, thanks for these extraordinary examples. Truly helpful advice. You raise valid points that if a leader cannot guarantee safety for employees offering honest feedback, there is a lack of honesty in the brainstorming and a tendency toward group-think. I like having some categories that indicate levels of agreement or dissent and a secret ballot sort of opportunity to expound on why the vote is whatever it is. In an established organization, the secret ballot has worked well for me and my groups but as an entrepreneur, that show of hands has been an essential component to encouraging creativity and involved problem solving…perhaps in the start up organization culture, employees may feel they have less to lose and/or more to gain from being heard. I’d be interested to hear anyone’s thoughts on that. Great topic and method for getting those objections early. I like to try and encourage these objections and opinions out of people as early as possible, since it gets more difficult the further down the line they come out. I also like that it takes us away from absolute decisions to a more realistic approach of “yeah I sort of like the idea, tell me more” and opens the door for discussion. A yay or nay approach closes doors. I hate to be the one that pooh-poohs this approach but someone needs to do it. I have seen a similar method be a disaster at the non-profit where I work – in fact reading this post brought back all sorts of bad memories of meetings now past. Instead of the five-to-fold method our former President used the “thumbs up, thumbs down, thumbs sideways” approach. When nearing decision time with our large group of 50-something executives, our CEO asked for a “show of thumbs” and insisted on full participation – you had to declare your up or down position to the group. 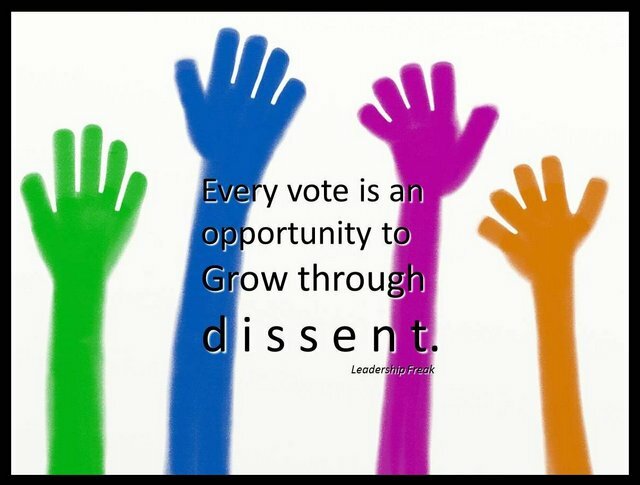 Instead of producing authentic discussion or dialog or even argument – dissenters (thumbs down or thumb sideways folks) got called out in front of their peers to defend their dissent – it was belittling and disrespected to us executive leaders and unfortunately too many times some leaders simply when along with thumbs up just to keep the peace. Ok, I admit that maybe this approach can work in a healthy team environment, but I found it humiliating. After our well-needed leadership change (a new President) our team got back to good old, plain, open dialog and discussion, yes, even argument, among peers in a safe environment – we are adults after all. Whatever happened to team meetings where men and women can express their open opinions for or against, fight for a position, and yet leave still teammates? Granted, this kind of working environment takes equal skill to create, but I’d rather have a “meeting of the minds” instead of a “meeting of the five-to-fold fingers!! !” I would avoid this approach with teammates that I respect and value. Thanks for listening. And please, no need to remind me that we had a very toxic environment that is now behind us. Thanks Tim. I’m thankful you shared your experience. If nothing else, it’s a reminder that people – not systems – get things done. Cheers. Tim, you make some good points, that as Dan points out reminds us that it’s about people. One of the issues we see, especially in larger groups, is that not everybody feels they have a voice. Maybe they’re shy, maybe they feel intimidated by more experienced / senior people in the group, maybe they take a long time to articulate their thoughts … there can be so many reasons why people hold themselves back. Using physical gestures like fist-to-five / five-to-fold (or dot voting, as one of the other contributors mentioned) is one way to level that out, then those people who have made their voices heard kinetically can then be given the space to articulate. The concern I would have with the scenario you paint, is that the thumbs is a mostly binary option (you’re either for or against, with an allowance for none-of-the-above as it was made mandatory). I would be uncomfortable with that, for the reasons you give; however, I have not seen the fist-to-five / five-to-fold approach used in that way … instead it tends to be used to assess our confidence in something, the complexity of something, and so on. A kinetic Likert scale, if you will. I am Axel from Germany. The Five-to-Fold Decision Making Model was created by Chris Weaver, Asheville, North Carolina, 10 years ago (www.onepurposedesign.org). I knew him personally. He passed away several weeks ago. I kindly ask you to reference in your blog on Chris and his website as the originator of the method. There is a world wide team taking care and taking stewardship of the method. For any questions according to the method please contact me or any other member of the team. Thanks Axel. I referenced Chris in the post. Thanks for the info. It feels sad to read that Chris passed away.